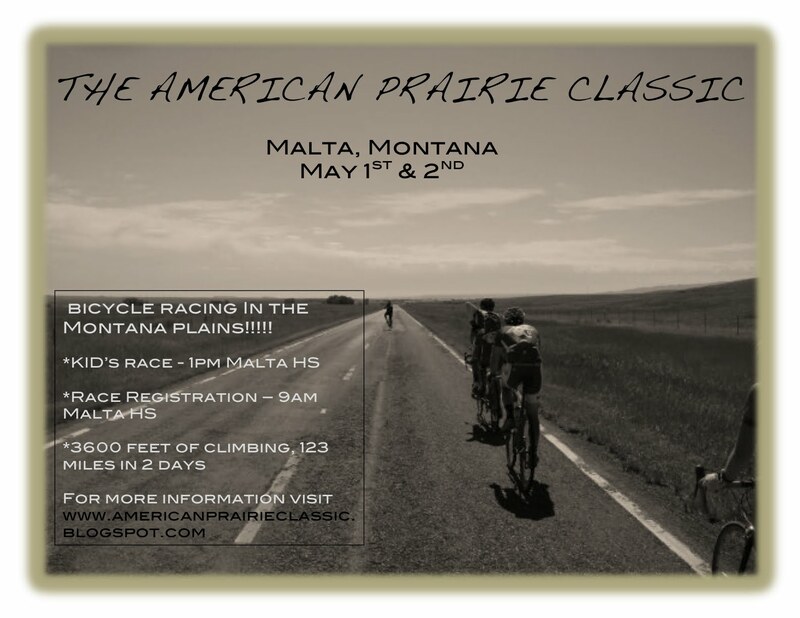 The American Prairie Classic is May 1st and 2nd. Online registration closes on April 28th. Signing up online saves you money and time at registration. Click here to register. The race blog is in my "Favorite Blogs" list. Visit the site for stage details and logistics. 1. It's a traveling race. The race starts in Malta with a prologue. Saturday afternoon riders race from Malta to the mountain town of Zortman. A luggage vehicle will transport your gear. 2. Meals. We have set up meals for our racers. Buffet style Dinner on Saturday night and breakfast on Sunday will be provided by the Miner's Cafe. $8.50 and $7. I'm still working on Saturday's lunch. 3. Free Camping. Saturday night in Zortman there will be free camping for all racers. 4. Race Course. Beautiful, traffic free roads in places you've never been. Surprisingly hilly finish on Saturday. 5. Leaders Jerseys. The best leaders jerseys you've ever seen. 6. Prize Money. Not a huge purse, but for MT $1500 ain't bad. 7. Kids Race. 1pm Saturday. 8. Relaxed vibe. I'm putting this on for the racers. I think this area has some beautiful riding. If you need help getting out there or with anything else just email me, montanacyclocross@gmail.com. I'm here for you! MSU and UM put on a fabulous weekend of collegiate racing. Each race had a true Montana feel. Hills and beautiful scenery were the name of the game. Once again I'm amazed at how cool Collegiate Cycling is. 95+ racers from all over the northwest came to Bozeman and Missoula to race. What pushed them to leave their northwest homes and travel 8+ hours? Collegiate Cycling is all about the team. If you've never spectated a collegiate cycling event....think high school track and field. People are sticking around to cheer for their teammates. There's the "token" couple on each team, the team captain herding cats, and the goofy team clown. It made me miss my collegiate days. I wanted to give a compliment to the University of Washington Cycling Team. They had huge numbers this weekend in Montana. Their killing the overall omnium and they all have great attitudes. Also, big shout out to Scott Lipp. I got to follow him in the wheel car for most of the race. He couldn't respond to the early attack, but slowly but surely he dropped every rider he was with. He chased alone in 3rd place for 45 minutes. It was and impressive showing of grit and determination.